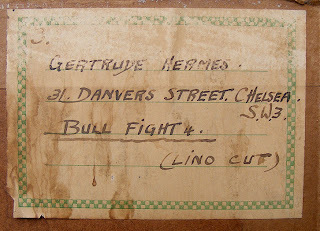 I have always regarded the work of Gertrude Hermes very highly. Her lively cutting and wonderful textures makes her work a treat to behold. It was, however a unexpected pleasure to be offered one in a gallery yesterday. The proprietor had shown some interesting works and, knowing that I was an engraver, went to an upstairs room to fetch another print. It turned out to be a Gertrude Hermes Linocut. 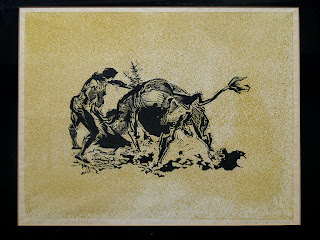 The print was signed and dated 1955 and inscribed "Bullfight 4" and then "No.1". 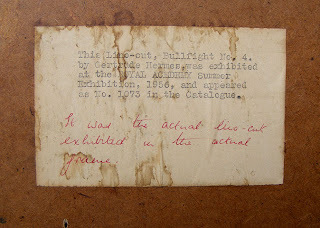 On the reverse were two labels, the artist's address and a second one informing the reader that this was the print in the original frame that was exhibited at the Royal Academy Summer Exhibition in 1956. I asked the price of the print and was told an acceptable sum. I decided to go away and think but, in the end, decided to buy the piece and add it to our collection. 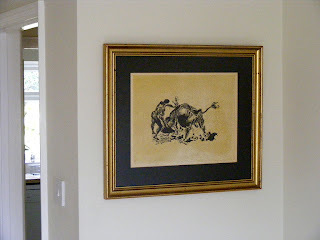 Once broght home and cleaned, we identified a suitable spot and I hung the linocut. Gertrude Hermes taught Sarah Van Niekirk who taught courses that I attended in the early 1990s. Hermes was married to Blair Hughes-Stanton, who taught my former colleague Pat Townshend, who first showed me the ropes of engraving. As a result, I have always felt that Gertrude Hermes was part of my printmaking ancestory and, having enjoyed her work in museum collections, I have, for a long time, hoped to acquire a piece. I am very happy.